It is time for another duo tangle over at The Diva's. I like duo tangle challenges for several reasons. One, it is nice not having to think about what patterns to use and two, it usually makes me use tangles that I don't know very well. 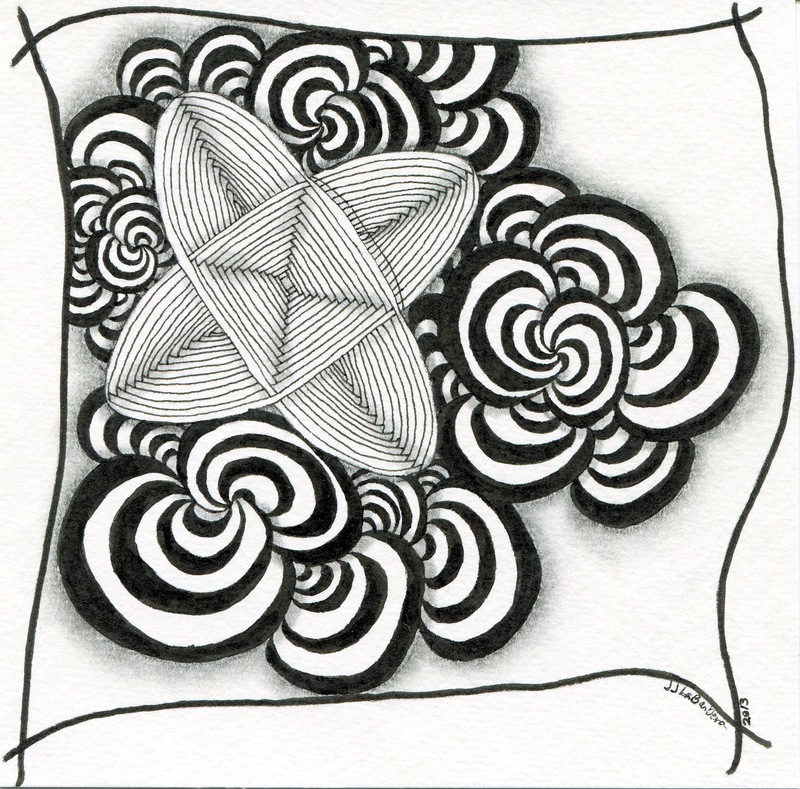 This challenge uses Auraknot and Bunzo, two official Zentangle patterns. I use Auraknot quite a bit. I really love it. I confess that I usually use a cookie cutter as a starting place for this pattern. Maybe one day I'll work up to starting with a freehand design. Bunzo I enjoy as well, but haven't used very much. Exploring it this week has been fun. 6X6" cold press watercolor paper, Micron pen and pencil. When I started this challenge I had no plan at all. I first marked off the frame. I wanted a heavier boarder than usual so I pulled out a micron brush pen to make that. I then drew my auraknot. There is a little mistake in there. I almost started over but I just kept at it. I was hoping that the lines would mask it a bit as I went along, but no such luck. Oh well, no big deal. Bunzo just sort of took on a life of its own after that. For Bunzo, I just went with exploring the process of creating the tangle. To keep the Auraknot from looking just slapped down, I surrounded it with Bunzo. After each part seemed to "grow" where it wanted to, I stopped and took a look wondering if I should keep going. It seemed finished to me so I stopped. I like the off center-ness of this one. I hope that you do too. I do like the Buzo surrounding Auraknot. There is a nice balance between light and dark. Great work. Love how concise the auraknot is, and then the reckless abandon of the bunzos. Off-center was perfect in this case. I love the spacial design in this tile! It is lovely!